Scottish Snapshots is a series of posts about places I visited in 2013 but didn’t write about at the time. This is the last – and it has turned into rather more than a snapshot. I had forgotten how many pictures we took! To those who haven’t been there, Dunblane possibly means one of two things: the site of a horrific school shooting in 1996 or the home town of Scottish tennis star, Andy Murray. You can’t escape either with touching memorials to the children and teacher who died and Andy’s golden post-box. (The Royal Mail painted a post-box in the home town of every gold medal winner at the London 2012 Olympics.) Dunblane is only a 45 minute drive from Glasgow, but we hadn’t visited for about 20 years, avoiding being grief-tourists, but when I read about a new hotel opening there I thought it would be a lovely place to stay for three nights between Christmas and New Year. Old Churches House is a row of 18th century cottages opposite the Cathedral which have been converted into a hotel and restaurant. It was very comfortable and the food was good – we had breakfast every day and dinner once. The other nights we ate at India Gate and Café Continental, both enjoyable. We used Dunblane’s Community Paths leaflet to explore the town thoroughly – the river (Allan Water) was impressively high. The museum and Leighton Library (oldest private library in Scotland) aren’t open in winter, so we’ll need to go back. Had to have my picture taken with the postbox! We also explored Dunblane by night – the Christmas lights were very pretty. On the one day with reasonable weather, we walked out to Sheriffmuir, site of a battle between the Jacobites and the Government Army in 1715. The monument is to the members of Clan MacRae who died there. There’s nothing like a walk with a strategically placed pub for lunch and the Sheriffmuir Inn didn’t disappoint, providing the best meal of the holiday. It’s beautiful inside too. This was a lovely “Twixmas” break – and there’s a lot to be said for a holiday where the journey home is only 45 minutes! We live very near these gardens and I’m able to walk through them most days. Lime Craig Trail is in Queen Elizabeth Forest Park. Start or finish with lunch in the recently refurbished Visitor centre above Aberfoyle and have a great walk. It was eerily misty on the November day we went, but we’ve also been to Lime Craig by a different route in summer weather – brighter pictures here. Scotland is not short of an iconic ruined castle or two. Last autumn, we visited four, all run by Historic Scotland. Since these posts are called Snapshots, I’m going to restrict myself to a photo and a fact about each. If you take an audio-tour of the castle, you’ll find it’s narrated by Terry Jones. 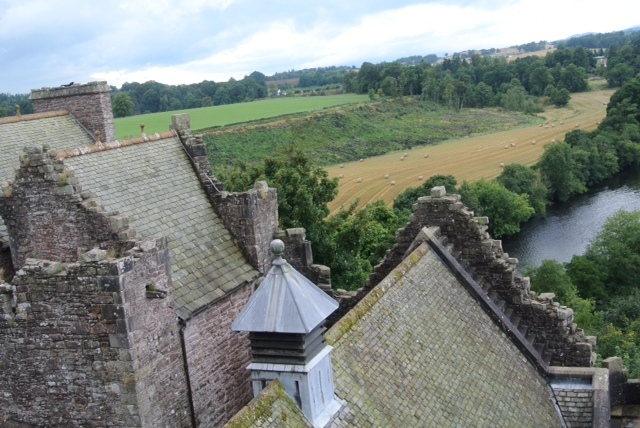 Monty Python and the Holy Grail was filmed at Doune. 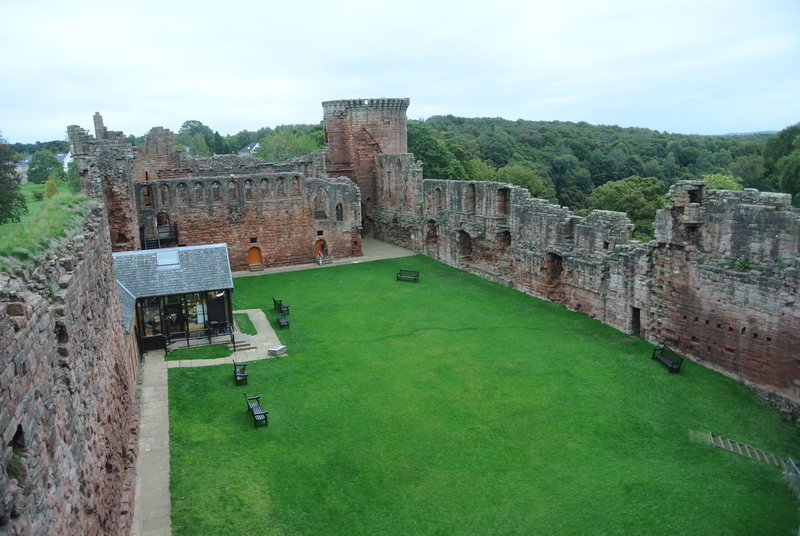 In 1301, Edward I of England, “Hammer of the Scots”, brought 6,800 soldiers to the castle. A huge siege engine was hauled from Glasgow and the garrison surrendered within the month. Boo! 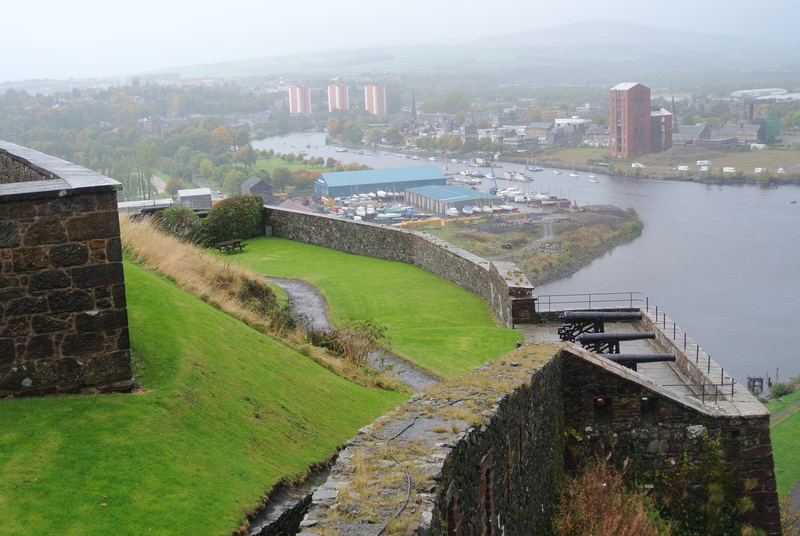 This castle is built high above the Clyde on the twin peaks of a volcanic rock. There are a lot of stairs! 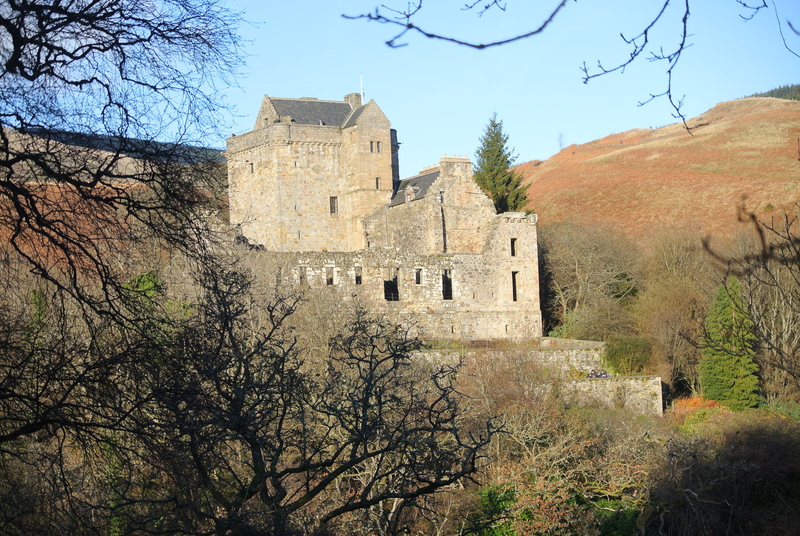 Castle Campbell used to be known as Castle Gloom or Glume. As you can see, it’s not at all gloomy on a bright autumn day – and it’s a lovely walk up the glen from the village of Dollar. We visited North Berwick, a seaside town on the east coast, on a day trip in May. Despite the month it was cold and windy, so we spent some of our time in the Scottish Seabird Centre which has a range of webcams to observe birds on the surrounding islands. It also has a nice display of quilting in its wee cinema and one of the mysterious Edinburgh Book Sculptures, based on Treasure Island, though this has since been moved to the National Library of Scotland. It’s an area formed by volcanoes – part of the beach is in the remains of a crater, and volcanic plugs are prominent inland (North Berwick Law) and at sea (Bass Rock). We didn’t climb the Law this time, though we have done in the past and no doubt will again in the future.